Thanks for visiting my listing! Here is a lot of 238 mixed sports cards: 1. 2015 Panini Black Gold Sizeable Rookie Signature Jerseys #SSRMD Mike Davis 183/199 2. 2016-17 Select Die-Cut Autographs Scope #53 David Thompson 6/25 3. 2008 Upper Deck Premier Blue #107 Jason Varitek 11/15 4. 2015 Panini Black Gold Rookie Autographs #RAURG Rashad Greene 60/99 5. 2016 Donruss Signature Series Elusive Ink #47 Jim Zorn 6. 2015 Panini Black Gold Rookie Autographs Gold #RAUBU Buck Allen 23/49 7. 2016 Panini Spectra Aspiring Patch Autographs #15 Kenneth Dixon 101/199 8. 2015 Panini Black Gold Grand Debut Autograph Jerseys #GDDC David Cobb 157/199 9. 2015 Panini Black Gold Grand Debut Autograph Jerseys #GDDC David Cobb 186/199 10. 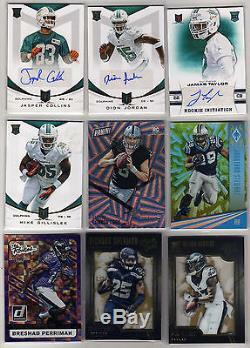 2013 Momentum Rookie Signatures #142 Jasper Collins 553/599 11. 2013 Momentum Rookie Signatures #128 Dion Jordan 225/399 12. 2013 Momentum Rookie Initiation Signatures #38 Jamar Taylor 105/299 13. 2013 Momentum Gold #170 Mike Gillislee 47/99 14. 2016 Panini Kickoff Wedges #78 Connor Cook 14/50 15. 2016 Panini Phoenix Yellow #15 Jonathan Stewart 16/25 16. 2015 Donruss The Rookies #4 Breshad Perriman 384/999 17. 2015 Panini Black Gold #45 Richard Sherman 78/199 18. 2015 Panini Black Gold #97 Nelson Agholor RC 52/199 19. 2015 Panini Black Gold Metallic Marks #MMRG Rashad Greene 5/99 20. 2015 Panini Black Gold Sizeable Signature Jerseys #SSLM Lamar Miller 97/99 21. 2015 Panini Black Gold Metallic Marks White Gold #MMDC David Cobb 26/49 22. 2015 Panini Black Gold Metallic Marks White Gold #MMBA Buck Allen 32/49 23. 2015 Panini Black Gold Gold Prospecting Quad Materials Prime #GP4TL Tyler Lockett 8/49 24. 2015 Panini Black Gold Gold Prospecting Quad Materials #GP4DP DeVante Parker 18/199 25. 2015 Panini Black Gold Gold Prospecting Quad Materials White Gold #GP4KW Karlos Williams 50/99 26. 2015 Panini Black Gold Gold Prospecting Quad Materials White Gold #GP4KW Karlos Williams 73/99 27. 2015 Panini Black Gold Gold Prospecting Quad Materials White Gold #GP4KW Karlos Williams 95/99 28. 2015 Panini Black Gold Gold Prospecting Quad Materials #GP4KW Karlos Williams 58/199 29. 2015 Panini Black Gold Gold Prospecting Quad Materials #GP4KW Karlos Williams 55/199 30. 2015 Panini Black Gold Gold Prospecting Quad Materials #GP4KW Karlos Williams 140/199 31. 2015 Panini Black Gold Golden Days #GDA26 Jimmy Graham 12/199 32. 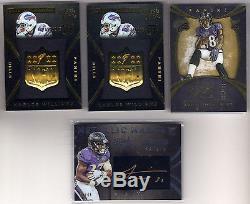 2015 Panini Black Gold Team Symbols #TMS5 Breshad Perriman 131/149 33. 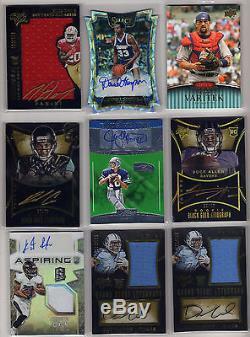 2015 Panini Black Gold Rookie Goldmine #RGM9 Breshad Perriman 166/199 34. 2015 Panini Black Gold Metallic Marks White Gold #MMBA Buck Allen 25/49 35. 2015 Panini Black Gold NFL Seal of Approval #SOA6 Karlos Williams 98/149 36. 2015 Panini Black Gold NFL Seal of Approval #SOA6 Karlos Williams 103/149 37. 2017 Donruss American Pride Silver #AP19 Evan Skoug 289/349 38. 2017 Donruss Aqueous Test Proof #151 Randal Grichuk 31/49 39. 2016 Donruss Black Border #96 Gerrit Cole 135/199 40. 2016 Donruss Press Proof Gold #141 Jonathan Lucroy 83/99 41. 2016 Donruss Press Proof Gold #50 Sonny Gray 86/99 42. 2016 Donruss Press Proof Gold #93 J. 2016 Donruss'82 Gold Press Proof #20 Dee Gordon 40/49 44. 2015 Topps Chrome Blue Refractors #149 Evan Gattis 55/150 45. 2000 Pacific Invincible Holographic Purple #133 Edgar Martinez 137/299 46. 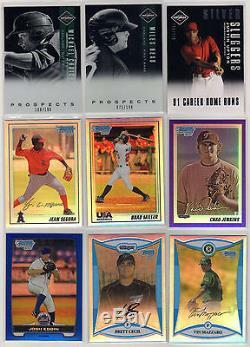 2011 Limited Prospects OptiChrome #1 Michael Choice 100/199 47. 2011 Limited Prospects OptiChrome #22 Miles Head 71/199 48. 2011 Limited Silver Sluggers #7 Justin Upton 118/249 49. 2010 Bowman Chrome Prospects Purple Refractors #BCP94 Chad Jenkins 721/999 50. 2010 Bowman Chrome USA Baseball Refractors #BC13 Brad Miller 199/777 51. 2010 Bowman Chrome Prospects Refractors #BCP7 Jean Segura 66/777 52. 2008 Bowman Chrome Prospects Refractors #BCP160 Vin Mazzaro 216/500 53. 2008 Bowman Chrome Prospects Refractors #BCP178 Brett Cecil 132/500 54. 2012 Bowman Chrome Prospects Blue Refractors #BCP28 Josh Edgin 225/250 55. 2015 Bowman Chrome Prospects Refractors #BCP151 Kyle Lloyd 30/499 56. 2015 Bowman Chrome Refractors #68 Yovani Gallardo 134/499 57. 2011 Bowman Prospects Blue #BP109 Darin Mastroianni 7/500 58. 2014 Bowman Blue #159 Wil Myers 387/500 59. 2007 Topps Turkey Red Chrome #46 Billy Wagner 1545/1999 60. 2011 Topps Heritage Chrome Refractors #C193 Adrian Gonzalez 246/562 61. 2013 Finest Green Refractors #78 Jacoby Ellsbury 185/199 62. 2009 Upper Deck Icons Future Foundations #MK Matt Kemp 774/999 63. 2013 Topps Gold #16 Andre Ethier 1167/2013 64. 2015 Topps Gold #18 Cody Allen 1734/2015 65. 2015 Topps Gold #177 Paul Konerko 306/2015 66. 2015 Topps Gold #528 Brad Ziegler 794/2015 67. 2015 Topps Update Gold #US6 David DeJesus 1639/2015 68. 2015 Topps Update Gold #US87 Zack Greinke 158/2015 69. 2015 Topps Update Gold #US273 Justin Upton 978/2015 70. 2010 Topps Gold Border #508 Chris Getz 1861/2010 71. 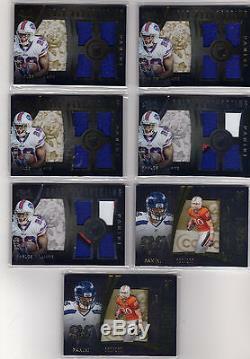 2011 Playoff Contenders Crystal Collection #49 J. 2011 Playoff Contenders Crystal Collection #9 Carlos Gonzalez 99/299 73. 2011 Playoff Contenders Playoff Ticket #15 Jordan Lyles 52/99 74. 2011 Playoff Contenders Playoff Ticket #29 David Freese 40/99 75. 2011 Playoff Contenders Playoff Ticket #1 Josh Hamilton 35/99 76. 2011 Playoff Contenders Draft Ticket Artist's Proof #DT12 Anderson Feliz 20/49 77. 2011 Playoff Contenders Draft Ticket Crystal Collection #DT12 Anderson Feliz 35/299 78. 2011 Playoff Contenders Draft Ticket Crystal Collection #DT12 Anderson Feliz 3/299 79. 2011 Donruss Elite Extra Edition Prospects Aspirations #71 Tom Robson 62/200 80. 2011 Donruss Elite Extra Edition Prospects Aspirations #P16 Danny Hultzen 80/200 81. 2011 Donruss Elite Extra Edition Prospects Aspirations #P17 Alex Hassan 111/200 82. 2011 Donruss Elite Extra Edition Prospects Status #84 Phillip Evans 83/100 83. 2011 Donruss Elite Extra Edition Prospects Status #52 Harold Martinez 12/100 84. 2015 Elite Extra Edition Status Blue Die Cut #147 Daniel Carbonell 61/100 85. 2015 Elite Extra Edition Aspirations Die Cut #45 Peter Lambert 32/200 86. 2015 Elite Extra Edition Aspirations Die Cut #102 Philip Pfeifer 152/200 87. 2015 Elite Extra Edition Aspirations Die Cut #87 Jacob Nix 165/200 88. 2015 Elite Extra Edition Aspirations Die Cut #118 Austin Allen 193/200 89. 2013 Momentum Platinum #138 Jamar Taylor 47/49 90. 1999 Playoff Momentum SSD X's #52 John Avery 294/300 91. 2006 Donruss Elite College Ties Green #4 Roger Staubach/Joe Bellino 117/1000 92. 2014 Topps Valor Strength #168 Troy Niklas 159/499 93. 2015 Certified Mirror Silver #68 Arian Foster 328/499 94. 2012 SPx #199 Rhett Ellison 318/750 95. 2007 Donruss Classics Legendary Players Silver #4 Cris Collinsworth 179/250 96. 2012-13 Elite Series Rookie Elite Series #21 Alexey Shved 171/199 97. 2012-13 Innovation #127 Alexey Shved RC 143/349 98. 2012-13 Elite Series #17 Jose Calderon 200/275 99. 2012-13 Elite Series #43 Michael Beasley 234/275 100. 2000-01 Ultimate Collection #53 Vince Carter 309/750 101. 2003-04 SP Authentic 10th Anniversary #SP9 Mike Modano 1475/1994 102. 2003-04 SP Authentic Honors #H20 Mike Modano 599/900 103. 2013-14 Artifacts Ruby #63 Michel Goulet 56/399 104. 2013-14 Artifacts Ruby #7 Blake Wheeler 98/399 105. 2015-16 Artifacts Ruby #41 James Neal 383/399 106. 2015-16 Artifacts Ruby #95 Ryan Johansen 204/399 107. 2014-15 Upper Deck Trilogy Radiant Green #122 William Karlsson 85/199 108. 2006-07 Parkhurst #177 Ted Lindsay 3763/3999 109. 2005-06 Ultimate Collection #202 Ole-Kristian Tollefsen RC 539/599 110. 2006-07 SPx SPxcitement #X81 Marc-Andre Fleury 406/999 111. 2006-07 SPx SPxcitement #X14 Lanny McDonald 926/999 112. 2006-07 SPx SPxcitement #X73 Peter Forsberg 721/999 113. 2003-04 Upper Deck Classic Portraits #159 Jason Spezza PS 633/650 114. 2008-09 SPx SPxcitement #X23 Henrik Zetterberg 946/999 115. 2008-09 SPx SPxcitement #X46 Nicklas Backstrom 316/999 116. 2007-08 SPx SPXtreme #X20 Dale Hawerchuk 389/999 117. 2007-08 SPx SPXtreme #X24 Ryan Miller 870/999 118. 2007-08 SPx SPXtreme #X60 Bobby Ryan 185/999 119. 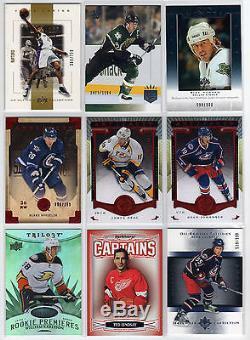 2013-14 Panini Contenders Norris Contenders #NC10 Seth Jones 340/499 120. 2014 Panini Father's Day #46 Valeri Nichushkin HK 30/599 121. 2003-04 SP Authentic 10th Anniversary #SP12 Joe Thornton 815/1994 122. 2003-04 SPx #159 Joe Thornton NG 429/500 123. 2014-15 Upper Deck Trilogy Radiant Blue #24 Blake Wheeler 41/121 124. 2015-16 Upper Deck Trilogy Rainbow Blue #63 Erik Karlsson 139/303 125. 2015-16 Upper Deck Trilogy Rainbow Blue #65 Jakub Voracek 264/372 126. 2015-16 Upper Deck Trilogy Rainbow Blue #62 Craig Anderson 262/406 127. 2015-16 Upper Deck Trilogy Rainbow Blue #5 Oliver Ekman-Larsson 106/761 128. 2015-16 Upper Deck Trilogy Rainbow Blue #5 Oliver Ekman-Larsson 240/761 129. 2015-16 Upper Deck Trilogy Rainbow Blue #5 Oliver Ekman-Larsson 426/761 130. 2015-16 Upper Deck Trilogy Rainbow Blue #82 Henrik Sedin 261/915 131. 2015-16 Upper Deck Trilogy Rainbow Blue #82 Henrik Sedin 335/915 132. 2015-16 Upper Deck Trilogy Rainbow Blue #82 Henrik Sedin 600/915 133. 2015-16 Upper Deck Trilogy Rainbow Blue #83 Ryan Miller 196/604 134. 2015 Panini Black Gold Golden Days #GDA26 Jimmy Graham 161/199 135. 2016 Panini Phoenix Pink #180 Sean Davis 228/299 136. 2007 Donruss Elite Turn of the Century Autographs #198 Yamon Figurs 49/100 137. 2016 Panini Prizm Rookie Autographs Prizms Purple Scope #45 Tyler Higbee 35/99 138. 2016 Select Swatches Prizm Purple #41 Todd Gurley II 38/60 (2 color patch) 139. 2016 Panini Phoenix Pink #156 Sheldon Rankins 193/299 140. 2015 Panini Prizm Rookie Autographs Prizms Blue #RSST Shaq Thompson 131/149 141. 2016 Panini Unparalleled Rookie Jerseys Dual #26 Pharoh Cooper 115/199 142. 2017 Certified New Generation Jerseys Mirror Orange #22 Chris Godwin 306/399 143. 2017 Certified Clutch Performers #7 Russell Wilson 162/399 (Jersey) 144. 2015 Rookies and Stars Longevity Team Name #130 Todd Gurley 63/299 145. 2017 Certified Mirror Silver #5 Joe Flacco 498/499 146. 2017 Certified #110 Steve Young IMM 990/999 147. 2017 Certified Mirror Silver #127 Heath Miller IMM 125/499 148. 2017 Certified Mirror Orange #1 Cam Newton 184/299 149. 2017 Certified Mirror Orange #20 Sammy Watkins 225/299 150. 2017 Certified Mirror Silver #136 Myles Garrett 173/299 151. 2013 Certified Potential Materials Prime #17 Kenny Stills 39/49 153. 2013 Certified Mirror Red #269 Mike Gillislee 22/250 154. 2013 Certified #240 Johnathan Cyprien RC 764/999 155. 2013 Certified #215 Conner Vernon RC 539/999 156. 2013 Certified #282 Dustin Hopkins RC 133/999 157. 2017 Certified Clutch Performers Jerseys #11 David Johnson 211/399 158. 2017 Panini Origins Blue #96 Mike Evans 29/60 159. 2017 Panini Origins Red #96 Mike Evans 43/299 160. 2017 Certified Mirror Orange #96 Michael Thomas 285/299 161. 2017 Certified #142 Shelton Gibson RC 692/999 162. 2017 Certified #142 Shelton Gibson RC 926/999 163. 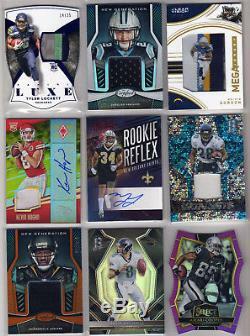 2017 Certified #153 Marshon Lattimore RC 767/999 164. 2017 Certified Mirror Silver #153 Marshon Lattimore 219/299 165. 2017 Certified Mirror Silver #63 David Johnson 403/499 166. 2017 Elite #104 Sefo Liufau RC 303/499 167. 2017 Panini Origins Red #90 Terrell Suggs 130/299 168. 2017 Panini Unparalleled Yellow #163 Wil Lutz 12/199 169. 2016 Select Autograph Materials Prizm #21 Matt Jones 22/49 170. 2009 Bowman Orange #86 Pat Burrell 174/250 171. 2009 Bowman Blue #99 Scott Olsen 93/500 172. 2009 Bowman Blue #154 Brett Myers 394/500 173. 2003 Upper Deck 40-Man Rainbow #692 Julian Tavarez 3/40 174. 2012 Bowman Chrome Blue Refractors #85 Alex Avila 108/250 175. 2014 Bowman Chrome Prospects Series 2 Blue Refractors #BCP85 Chad Pinder 23/250 176. 2012 Topps Tribute Blue #74 David Freese 171/199 177. 2012 Topps Triple Threads Emerald #48 David Freese 18/250 178. 2007 Topps 52 Chrome #66 Brian Esposito 1424/1952 179. 2014 Donruss The Rookies Press Proofs Gold #37 Brian Flynn 72/99 180. 2014 Donruss Stat Line Career #55 Michael Cuddyer 193/300 181. 2008 Topps Moments and Milestones #60-17 Chase Utley 97/150 182. 2001 SP Authentic #174 Magglio Ordonez SS 948/1250 183. 2015 Topps Pink #624 Miguel Alfredo Gonzalez 24/50 184. 2015 Topps Gold #527 Carlos Martinez 233/2015 185. 2015 Topps Gold #423 Javy Guerra 1135/2015 186. 2015 Topps Gold #677 Ryan Goins 523/2015 187. 2015 Topps Gold #693 Jason Rogers 566/2015 188. 2010 Topps Update Gold #US238 Mark Ellis 1115/2010 189. 2010 Topps Gold Border #319 Ryan Franklin 389/2010 190. 2010 Topps Gold Border #271 Jermaine Dye 1695/2010 191. 2011 Topps Gold #362 Doug Fister 756/2011 192. 2013 Topps Gold #13 Brett Lawrie 666/2013 193. 2014 Topps Gold #653 Jose Iglesias 1423/2014 194. 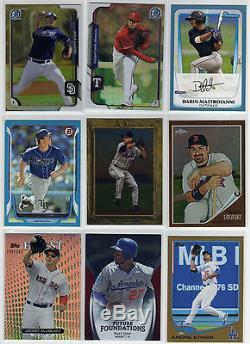 2014 Topps Gold #346 Derek Norris 1552/2014 195. 2014 Topps Gold #495 John Axford 506/2014 196. 2014 Topps Gold #609 Jonathan Pettibone 1694/2014 197. 2014 Topps Gold #513 Jordan Pacheco 1400/2014 198. 2014 Topps Gold #657 Corey Hart 1713/2014 199. 2014 Topps Gold #589 Chris Carter 1496/2014 200. 2014 Topps Update Gold #US213 Stefen Romero 1357/2014 201. 2014 Topps Update Gold #US9 Francisco Rodriguez 1986/2014 202. 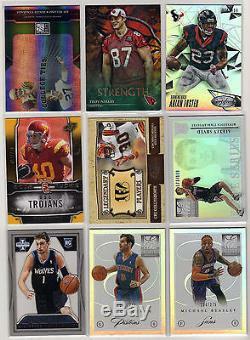 2014 Topps Update Gold #US145 A. 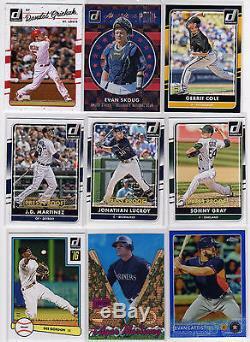 2014 Topps Update Gold #US246 Erick Aybar 1754/2014 204. 2016 Topps Pro Debut Gold #141 Gareth Morgan 44/50 205. 2013 Topps Mini Gold #293 Jeff Karstens 30/62 206. 2014 Topps Gold #192 Pedro Alvarez 1797/2014 207. 2014 Topps Gold #31 Victor Martinez 1729/2014 208. 2011 Topps Gold #181 Magglio Ordonez 1271/2011 209. 2009 Topps Heritage Chrome Refractors #CHR148 Chris Coghlan 395/560 210. 2014 Topps Opening Day Blue #26 Jonathan Papelbon 1586/2014 211. 2017 Panini Origins Red #46 Robert Kelley 27/299 212. 2017 Panini Origins Red #46 Robert Kelley 268/299 213. 2017 Panini Origins Red #83 Jadeveon Clowney 24/299 214. 2017 Panini Origins Red #89 Mike Wallace 3/299 215. 2017 Panini Origins Orange #89 Mike Wallace 35/150 216. 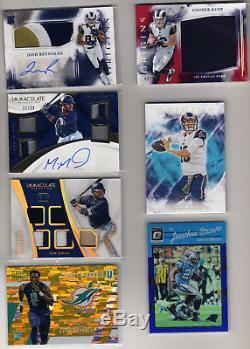 2013 Certified Skills Materials #27 LeSean McCoy 112/299 217. 2013 Certified Mirror Red #122 DeSean Jackson 70/250 218. 2017 Absolute #156 Gerald Everett RC 416/499 219. 2017 Absolute #175 Sam Rogers RC 198/499 220. 2017 Absolute Spectrum Red #161 Shelton Gibson 77/100 221. 2014 Topps Gold #87 Tyson Ross 1960/2014 222. 2011 Topps Gold #248 Wade LeBlanc 855/2011 223. 2017 Panini Origins #140 Josh Reynolds JSY AU RC (3 color patch) 224. 2017 Panini Origins Rookie Jumbo Jerseys Red #16 Cooper Kupp 62/99 225. 2017 Panini Origins Turquoise #28 Jared Goff 18/25 226. 2015 Panini Luxe Memorabilia Die Cuts Prime Blue #79 Tyler Lockett 14/25 227. 2017 Immaculate Collection Immaculate Quad Autograph Materials Rookie #11 Manuel Margot 22/99 228. 2017 Immaculate Collection Immaculate Material Gold #12 Manuel Margot 5/49 229. 2017 Certified New Generation Jerseys #5 Christian McCaffrey 230. 2016 Panini Clear Vision Mega Jerseys Prime #10 Melvin Gordon 45/49 231. 2016 Panini Phoenix Yellow #226 Kevin Hogan 48/49 JSY AU 232. 2017 Absolute Rookie Reflex Signatures Red #21 Marshon Lattimore 233. 2017 Panini Spectra Catalysts Jerseys Neon Blue #15 Fred Taylor 87/99 234. 2017 Certified New Generation Jerseys Mirror Orange #30 Dede Westbrook 341/399 235. 2017 Panini Spectra #117 Mark Brunell 18/99 236. 2016 Select Prizm Purple #143 Amari Cooper 40/75 237. 2016 Donruss Optic Blue #14 Jonathan Stewart 63/149 238. 2017 Panini Unparalleled Yellow #240 Charles Harris 27/199 These are VERY hard to find, especially at this price. This would be a great addition to any store inventory, show box or modern card collection! Please see scans for the actual item you will receive. All my items come from a clean, smoke free and child free home. I will not end this listing early but feel free to make an offer (I WILL NOT DIRECTLY ACCEPT AN OFFER, I WILL REVISE THE ITEM PRICE SO YOU STILL HAVE TO PAY BEFORE THE LISTING ENDS). Also no APOs or PO Boxes please. MANDATORY NOTE TO CALIFORNIA RESIDENTS: Due to Laws in the state of California including but not limited to California Law AB-1570, we are unable to sell Autographed collectables to any residents of the state of California. Then we show or describe as being included in the individual listing. We firmly believe that all of our autographed collectables are authentic. We do research on every item we offer for sale, however we are not autograph experts. Please visit my other listings as well! The item "238x Auto Autograph Patch Jersey S/N Lot Christian Mccaffrey Russell Wilson" is in sale since Wednesday, October 04, 2017. This item is in the category "Sports Mem, Cards & Fan Shop\Sports Trading Cards\Football Cards". The seller is "specialoccasions" and is located in West Haven, Connecticut.